Place into an old pan or heat proof dish. Heat up your barbecue and place the pan into the barbecue and place the smoking chips onto the barbecue and close the lid. Cook on a medium heat until most of the liquid has gone, if you need the barbecue for other jobs this can be finished in your oven. Heat up the barbecue and remove the pineapple from the dish and cook, brushing every now and then with the juice left in the dish from the marinade of the pineapple. Keep on turning the pineapple so not to burn it. The pineapple should take about 30 minutes to cook. 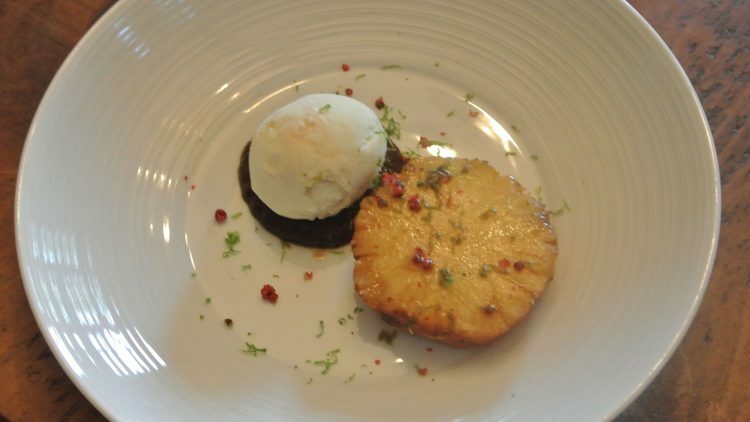 Once the pineapple is cooked slice and serve with grated lime zest, chopped pink peppercorns and ice cream.